I recently had a brilliant idea, brilliance being subjective of course, and I decided that I wanted to share it but I also wanted become known for coming up with this brilliant idea. I mentioned it to my partner, because he's a good person to bounce brilliant ideas off of, and he'll usually let me know when they're not that brilliant. And he won't steal my ideas either, because he's an architect and works in a different realm of relationships with material consumption (a topic for another column, I promise). So I thought about it a little longer, and then I thought about who I could discuss it with, people with more knowledge, background, and information than me, but who would also hold my confidences. And eventually I found the right moment and mentioned it to one of the smart people, and he nodded and said, that's not a bad idea. Which was encouraging, but didn't explode into the potential brilliance I expected/hoped for. Then I told the other smart person, but it was in a loud club and he can't hear out of one ear and he too nodded and said that's a good idea but I wasn't sure that he totally heard me or if he was just being polite and wanting to go get another drink. So then I went and told a whole bunch of people, people without the requisite technical background but people who would totally understand and get the intention and the huge potential of this brilliant idea and then, then I finally got some of the reaction I had been hoping for. And these smart people, they said yeah, we should talk more about that. That could turn into something big. And then we all went back to our daily lives and work and the idea didn't grow or get called in to Someone Important, someone with the power to make brilliant ideas become daily reality. Which is really what it should become: our daily reality. So now I'm going to tell all of you about my brilliant idea, partly because I still want to be known as the person who came up with this idea (and yes, in my delusion I'm already imagining the Wikipedia entry), and partly because I want this idea to sprout and develop and flourish and propagate. Because we should all benefit from this brilliant idea, whether it's truly brilliant or not. Because what is sharing if not tapping resources for the greater benefit? 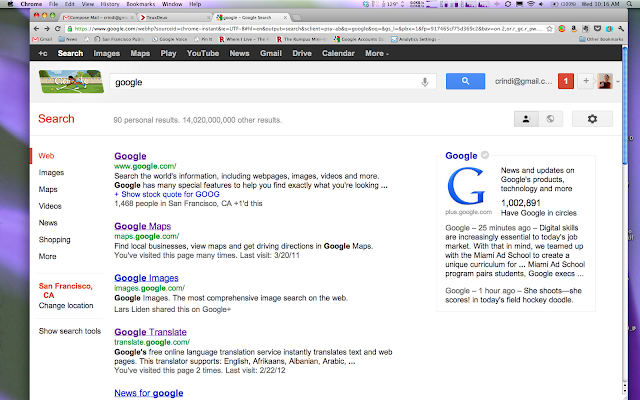 I think Google should have a SHARING section in the left hand column. 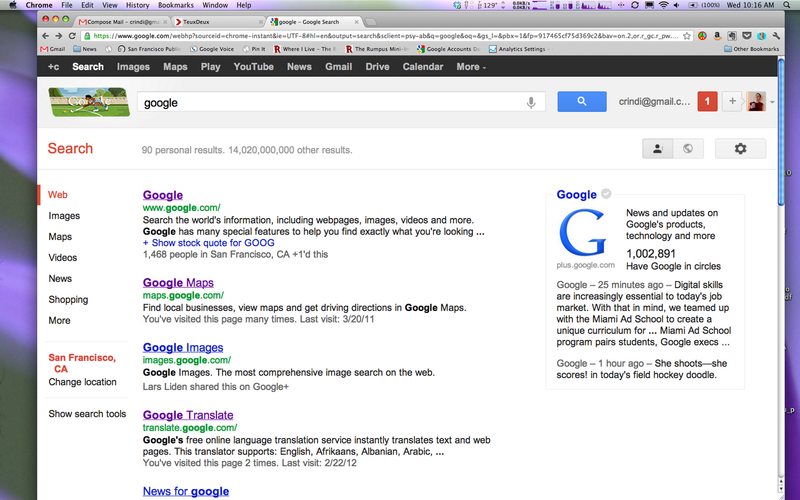 To clarify, I give you a screenshot of the current Google Search screen. You see that list on the left side? The options to narrow your search? You could type in a topic and find Web, Images, Map, Videos, News, Shopping, More. You see what's missing? SHARING! Let's say I type in Power Drill because I need to assemble that Ikea cabinet quickly and my only screwdriver is a Phillips and it's too long and inefficient. Sure the search could direct me to buy a new one at Home Depot (Shopping) or watch a video on how to use a power drill (Videos), or find out what a power drill looks like (Images), or read Gizmodo's admonitions on how useful power drills are (News), and of course, where to buy it (Maps). And the More option in the column would give me Books on power drills, power drill companies (Places), Blogs on power drills (seriously), flights from San Francisco to Las Vegas (what? ), Discussions on power drills, how to open a coconut with a power drill (Recipes), software related to power drills (Applications), and Patents on power drill technologies. But I'm only going to need that drill for an hour or so to assemble my cabinet, so how could a Sharing section help me instead? Imagine if Google Search Sharing gave me a list of neighbors nearby who were sharing their drill (Neighborgoods), or companies from whom I could rent it (Rentalic), or brands that hold up best to repeated uses when shared. It could include collcons and peer-to-peer services with people who could bring that power drill to you (TaskRabbit, Zaarly) or teach you how to use it (Skillshare). Google could monetize the search the same way it currently monetizes other searches, by selling ads to all the current sharing services (eg. Zilok, NeighBorrow, Share Some Sugar, Friends With Things). Heck, if you already had a power drill that didn't work well, the Sharing section could include places to learn how to fix it (TechShop), barter for help (TimeBanks), sell it (eBay, Craigslist), or hack it into something cool (NoiseBridge). There really are a ton more options that could be added or included in the Sharing section, and they are growing by the day. So, what would this mean for Google? One more useful resource to offer that will drive traffic to their site. What would this mean for the general public? This simple button could introduce a huge section of the population to the sharing economy and collaborative consumption movement. It could be a gateway into a sociological shift, the re-imagining of how we interact with tools, with stuff, with services, and with our neighbors. This brilliant idea has the potential to be more than just a practical tool, it could really get the rest of the Google-using world, the people who either can't afford their own power drill, or have a garage full of unused power drills, to rethink their roles and responsibilities with our diminishing natural resources. And I really think that's a brilliant idea.